The National Diaper Bank Network (NDBN) has established the “Diapers for Babies” hurricane fund to help get clean diapers to children and families impacted by Hurricane Michael. 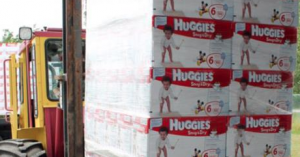 Disposable diapers are among the first items families with young children need when displaced by a major disaster such as Hurricane Michael. NEW HAVEN, CT, USA, October 11, 2018 /EINPresswire.com/ -- The National Diaper Bank Network (NDBN) has established the “Diapers for Babies” hurricane fund to help get clean diapers to children and families impacted by Hurricane Michael. Individuals and organizations can donate to NDBN’s “Diapers for Babies” hurricane fund by clicking on the donate button at nationaldiaperbanknetwork.org. In the past two years, NDBN and member diaper bank programs have distributed millions of diapers to families impacted by disasters, including Hurricanes Harvey, Irma, and Maria in 2017, and Hurricane Florence last month. Cash donations by individuals and groups are more impactful than collecting, and shipping individual boxes of diapers across the country. Shipping is more expensive than most people consider. Plus, donated dollars allow NDBN and member diaper bank programs to acquire twice as many diapers, on average, at costs lower than wholesale. However, many people want to purchase and deliver diapers directly to diaper bank programs serving impacted areas. NDBN recommends supporting accredited member diaper bank programs, such as the Junior League of Panama City Diaper Bank, by making a direct donation to the organization. For more information on how to support NDBN and its efforts to help families affected by the hurricanes and other disasters, log on to nationaldiaperbanknetwork.org. The National Diaper Bank Network (NDBN) is a nationwide nonprofit dedicated to eliminating diaper need in America, by leading a national movement to help meet the basic needs of all babies and their families…including access to clean, dry diapers and other material goods. Founded in 2011 with the support of Huggies®, the network raises national awareness of diaper need (#DiaperNeed) and supports the development and expansion of diaper banks in communities throughout the country. Its active membership includes more than 200 diaper banks, diaper pantries, and food banks located in 47 U.S. states and the District of Columbia. More information on NDBN and diaper need is available at nationaldiaperbanknetwork.org, and on Twitter (@DiaperNetwork) and Facebook. Donated dollars allow NDBN and member diaper bank programs to acquire twice as many diapers, on average, at costs lower than wholesale.